I giovani chiedono armi. Gli anziani approvano. «Le nostre sofferenze di oggi sono il preludio di quelle che subirete anche voi europei e cristiani occidentali nel prossimo futuro», dice il 47enne Amel Nona, l’arcivescovo caldeo di Mosul fuggito ad Erbil. Il messaggio è inequivocabile: l’unico modo per fermare l’esodo cristiano dai luoghi che ne videro le origini in epoca pre-islamica è rispondere alla violenza con la violenza, alla forza con la forza. Nona è un uomo ferito, addolorato, ma non rassegnato. «Ho perso la mia diocesi. Il luogo fisico del mio apostolato è stato occupato dai radicali islamici che ci vogliono convertiti o morti. Ma la mia comunità è ancora viva». E’ ben contento di incontrare la stampa occidentale. «Per favore, cercate di capirci – esclama -. I vostri principi liberali e democratici qui non valgono nulla. Occorre che ripensiate alla nostra realtà in Medio Oriente perché state accogliendo nei vostri Paesi un numero sempre crescente di musulmani. Anche voi siete a rischio. Dovete prendere decisioni forti e coraggiose, a costo di contraddire i vostri principi. Voi pensate che gli uomini sono tutti uguali – continua l’arcivescovo Amel Nona – Ma non è vero. L’Islam non dice che gli uomini sono tutti uguali. I vostri valori non sono i loro valori. Se non lo capite in tempo, diventerete vittime del nemico che avete accolto in casa vostra». All of these are pertinent; any of them would be an admissible truth, though not all an advisable headline. And none of these phrases is likely to be uttered by any Western church leader, simply because there is so little understanding in the liberal and democratic Christian West of the Islamic Hydra that manifests itself so variably across what we call the Arab-Muslim world. Even the ubiquity of this geo-ethnic-religious term is indicative of the paucity of theological knowledge and religious observation, for not all Muslims are Arab; not all Arabs subscribe to the same doctrine of Allah; and not all Muslims accord with any notion of inhabiting the same world as those they view as heretics and apostates. But, to most of us in the liberal and democratic West, this is Islam and they are all Muslims. We can quibble over the meaning of “true” Islam and cavil about what it is to be a “real” Muslim. And we do. And in the liberal and democratic West we are free to do so – at least for now. We are repeatedly told by our schoolteachers and hear in abundance from our political leaders of our common values, our shared truths, and our established assertions of tolerance and respect in an inescapable framework of equality. But what do these values mean to the Islamic State which, some aver, is no Islamic State at all, but a perversion of Islam and a corruption of the very definition of ‘state’? “Your values are not their values,” says the exiled Archbishop of Mosul, as he warns of the danger of welcoming “an ever growing number of Muslims”. Are his Muslims the same as our Muslims? Is he being “racist” or “Islamophobic”? The media are silent, and the politicians mute. Demographically, it is already too late. With one eye permanently fixed on the electoral cycle and the other on Baroness Warsi, the “Muslim vote” must be heeded. And yet this “Muslim vote” is as nebulous and incoherent as the “Muslim world”. Some of them vote Conservative, one or two incline toward Ukip, and many more are Liberal Democrats. But most are tribal Labour supporters – simply because their parents and grandparents found succour in their community compassion and generous notions of welfare. No one has bothered to research the disparate voting intentions of British Sunni, Shia, Sufi or Ahmadiyya Muslims. But it gets worse: they are the “ethnic minority vote”, as though a plethora of Islamic denominations can be lumped in with Sikhs, Hindus, Buddhists, Black Caribbean, Black African or Black ‘Other’.. Funny, isn’t it, how we so easily conflate “ethnic minority” with “religious minority”. And funny, too, that so few of us classify Jews in the same socio-political category. The historic schism between Sunni and Shia Islam is becoming a global conflict. Israel and the Jews are the only common enemy. Palestine is all that unites them. Or so the narrative goes. But Sunni and Shia are themselves riven with religious fractures and political fissures, such that they routinely denounce one another as heretics like the pretender popes of old, fiddling with their mutual excommunications while the world burns. We have before us the present foreign-policy obsessions – Gaza, Syria, Iraq and Iran. Egypt, Pakistan and Afghanistan seem to come and go. We hear mutterings of Yemen and Qatar. Saudi Arabia rarely hits the radar, unless they’re flogging women or hanging gays. We flit about from one to the other trying to negotiate ‘peace’ while selling them missiles, bombs and bullets. Incredibly, we are about to ally ourselves with Shia Iran in order to defeat the greater evil of the Sunni Islamic State. This is profoundly misguided. Our enemies enemy is still our enemy. 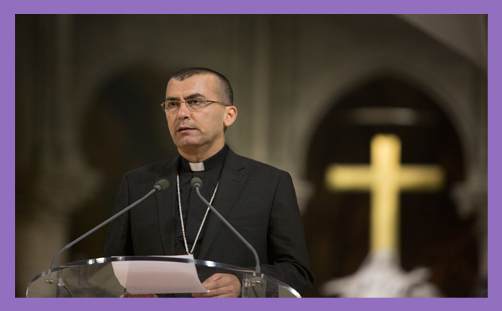 The West must heed the stark warning of Archbishop Emil Nona, and do so before it is too late. Mosul has fallen: his warning is that Toulouse, Brussels or Liege might be next. For now, the battleground is fixed in the Middle East. But Jihadi-Salfist theatres of war recognise no state borders, and they have no time at all for democracy, diplomacy, or “moderate” notions of Islam which is not “proper” or “true” Islam. These fanatics find our governments weak and compliant; our liberal and democratic principles quite conducive to their political objectives; our Christianity favourably disposed to a multi-faith ecumenical love-in. This unpalatable truth may irritate our democratic politicians and cause a few ripples among our liberal bishops. But Archbishop Emil Nona has seen the evil, and calls it so. There can be no fellowship of darkness with light.